Four defending champions are among 294 nominations to the 19th running of the $1.11 million Claiming Crown set for Saturday, Dec. 2, opening day of Gulfstream Park’s 2017-2018 Championship Meet. 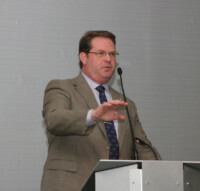 Total handle for the Claiming Crown has topped $10 million each of the past three years topped by a record $11.1 million in 2016, when the event attracted a total of 281 nominations. 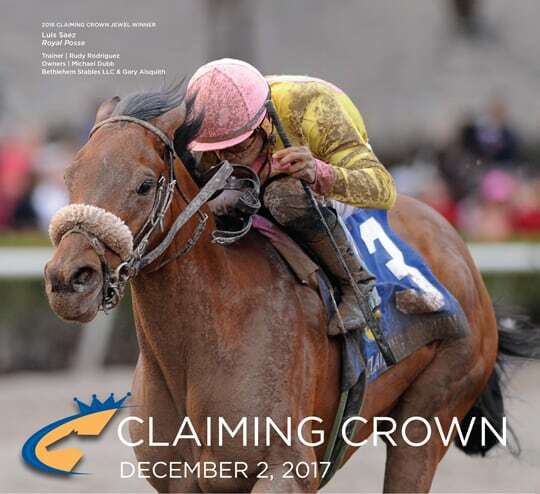 The richest event on the Claiming Crown program is the $200,000 Jewel at 1 1/8 miles for 3-year-olds and up which have started for a claiming price of $35,000 or less since Jan. 1, 2016. Among the 27 nominees are three from Maker – Capital Letters, 2016 Rapid Transit runner-up Flashy Jewel and Futile – along with Diamond Bachelor and multiple stakes winner John Jones, who ran 2-3 behind Royal Posse last year, and Gigantic Breeze, twice Grade 3-placed at Woodbine this summer. Two-time Grade 2 winner Starship Jubilee, Delaware Handicap (G1) and Spinster (G1) runner-up Martini Glass, multiple stakes winners Dynatail and Gianna’s Dream and Grade 3-placed Cuddle Alert are among 29 nominees to the $125,000 Tiara at 1 1/16 miles on turf for fillies and mares and up which have run for a tag of $25,000 or less. Most popular among horsemen with 52 nominations is the $125,000 Emerald for 3-year-olds and up that have started for $25,000 or less going 1 1/16 miles on turf. Cammack and Laythatpistoldown, separated by a nose when fourth and fifth, respectively, in a five-way photo finish during last year’s race, are nominated, as are Gigantic Breeze, John Jones and stakes winners Black Tide, D’craziness, Special Ops, Spring Up, Swagger Jagger and Threeohtwocassie. Grade 3 winner Doctor J Dub; Bull Dozer, a winner of 21 of 79 career starts and $632,663 in purse earnings; stakes winners Bass River Road and Helloitsme; and Proper Freud and Express Bet, second and third, respectively, in last year’s race, are among 37 nominees to the $110,000 Express at six furlongs. Nominated to defend their 2016 victories are Super Spender in the $110,000 Canterbury at five furlongs on turf, Tormenta de Oro in the $110,000 Glass Slipper at one mile, Chepstow in the $110,000 Iron Horse at 1 1/16 miles and Shaft of Light in the $110,000 Rapid Transit at seven furlongs. 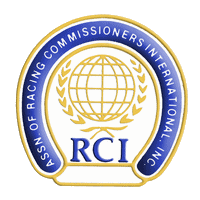 New to the Claiming Crown program last year, the $110,000 Distaff Dash at five furlongs on turf for fillies and mares 3 and up that have run for $25,000 or less returns with 23 nominations led by My Sister Caro, Lady Coventry and Eila, who ran second, third and fourth, respectively, in 2016. Nomination lists and past performances are available at www.claimingcrown.com.